The German Congress of Orthopaedics and Traumatology, DKOU, is being held this month in Berlin under the triple chairmanship of Werner Siebert, Joachim Windolf and Gerd Rauch. 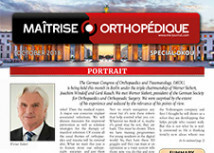 We met Werner Siebert, president of the German Society for Orthopaedics and Orthopeadic Surgery. We were surprised by the extent of his experience and seduced by the relevance of his points of view. Total hip arthroplasty (THA) is one of the most successful procedures of the last century providing excellent long-term results. 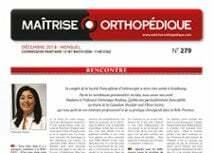 However, worldwide increasingly young and active patients with osteoarthritis are treated with THA, thus being more demanding regarding postoperative clinical function and physical activity.